During the nine day stay at Estacion Biologica Cocha Cashu in Manu National Park, students broke off into groups or worked alone to research a topic of interest to them. 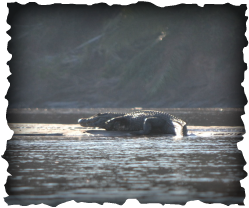 Projects ranged in topics and activities from censusing trees or caiman to watching the fauna that visit a fruiting fig tree. Below you will find descriptions of several of the projects completed by students this summer. The project conducted by this young lad was probably the most interesting, which is why it is listed first. I followed monkeys. I know, sounds more like fun than work. Well, it was... I even played TAG with them (okay, I didn't play TAG, but still). As industrialization grows and deforestation continues to destroy invaluable tropical rainforest, public media has emphasized more attention on efforts that battle the destruction of nature. The harmfulness of human civilization in rainforests is becoming obviously pervasive on a global scale. Studies show that the loss of a keystone species can lead to the collapse of the ecosystem that it inhabits. There has been evidence to draw implications of an ecosystem’s health by focusing on population growth levels of the animals which depend on such keystone species due to bottom-up regulatory processes. A census of nonhuman primates was conducted in the biological station at Cocha Cashu, Peru. Average densities of studied species were compared to reported densities from 1983. The results demonstrate a decline in population densities over a 3 decade period. This decline in the densities of primates could imply a decline in fig tree populations, a keystone species of most tropical rainforests. Explanations for the observed patterns are discussed in further detail [in the paper]. Future studies on fig tree population sizes could add supplementary insight to the effects of human influence on ecosystems in the tropics. For my project, I observed the birds and monkeys that fed in a fruiting fig tree for a total of 24 hours over a five day period. Fruiting fig trees play an important role in neotropical rainforest ecosystems, as they provide a food source for many species, especially in the dry season when other food sources are scarce. Over 25 species of birds and 4 different species of monkeys were observed in the fig tree at least once. Several of the bird species (especially Spix's Guan, Blue-Throated Piping Guan, Channel-Billed Toucan, and the Black-Faced Cotinga) spent a significant amount of time foraging in the fig tree, while some were seen only landing in the tree. The particular fig tree studied, though, was clearly a huge food source for four different species of monkeys--Brown Capuchins, White-Fronted Capuchins, Black Spiders and Red Howlers. In the 24 hours of observation, at least one species of monkey was seen feeding in the fig tree. Some individual spider monkeys, in particular, were observed spending over 3 hours at a time feeding in the tree. Overall, I found that the fruiting fig tree was a food source for a diversity of bird species and was an extremely important food source for monkeys, who consume a significant amount of biomass in the rainforest. These findings indicate that fig trees must be conserved so that many birds and monkeys can survive. 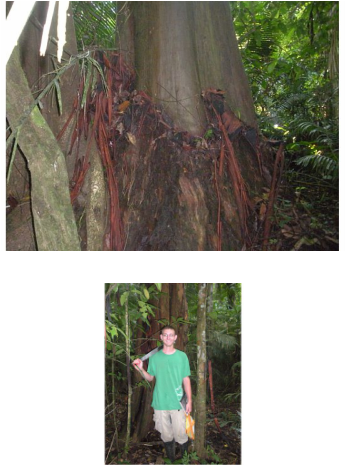 We studied the tree Calycophyllum spruceanum which sheds its reddish colored bark. This species is from the family rubiacae and has opposite leaves with interpetiolar stipules. Our project was concerned with the shedding of the bark and whether this affects the number of lianas or hemiepiphytes growing on the tree. The circumference of fifty two trees were measured and the number of lianas and hemiepiphytes on each was counted. The ratio of diameter to lianas was compared to the same ratio for non-peeling trees in the same vicinity. In general we found that the calycophyllum spruceanum had fewer lianas on parts of the trunk that had already shed their bark than surrounding non-peeling trees. 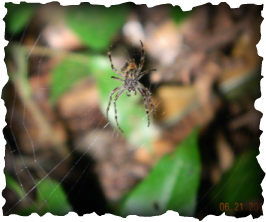 I studied the effects of orb web orientation on prey capturing efficacy in orb webs. 85 spider webs were censused over 0.5km of land at Cocha Cashu Biological Station. The webs were analysed for web type, the number of prey present, the number of spiders present, and orb radius. The results were analyzed using a non-parametric Wilcoxon signed-rank test. An insignificant difference was found between the abilities of horizontally-oriented and vertically-oriented orb webs to capture and retain prey. Future studies should examine the orientation of orb webs with regard given to multiple variables, such as the orb's effect on thermoregulatory processes, the orientation's effect on minimizing web damage, and limitations placed on the web design due to the surrounding environment. We censused spiky trees, more formally known as Caricaceae Jacaratia Digitata. We examined four different kinds of forest, mature, young, swamp, and successional. By walking down the trail we able to look on either side and spot the characteristics of our trees. Jacaratia Digitata is easily identified with medieval looking spikes up the monipodial trunk and palmately compound leaves. We found that Jacaratia Digitata is most commonly found in treefall areas of mature forest. Because these trees live in such a specific location in the forest they have to be bat-dispersed in order to find treefalls across the terrain. 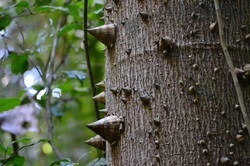 The spikes up the trunk prevent mammals from climbing the trees and dropping the seeds in the same location. Our project censused the juvenile and adult black caiman (Melanosuchus niger) of Cocha Cashu relative to bank vegetation. The vegetation of the lake's perimeter was surveyed during the day using GPS tracking and was designated as grassy or woody. Caiman counting was performed from canoe over the course of two successive nights by the use of handheld spotlights which reflected the caimans' eyes in the darkness. Juveniles in the grass were identified by their croaking calls. Results showed that the M. niger population has increased greatly even within the last year. Juveniles kept to areas of grassy vegetation, while adults were shown to be territorial and located in more open areas. Our project looked at the complex interaction between the Pseudomyrmex ant and its host tree the Triplaris americana. Using the trail system extending to the south and west of the Cocha Cashu, we located ten T. americana trees that were deemed suitable for study. Over the course of 4 days, we attached a different type of leaf to the tree and to observe the aggressive attacking behavior of the ants. After 24 hours, we came back to each tree to collect the sample and start the next days trial. We hypothesized that the ants would be able to determine self from non-self, and that this difference would be measurable in a greater amount of leaf material damaged by the ants on the unrelated samples. Our data showed exactly the opposite! The experiment was fun and informative, but we did suffer quite a few ant bites. The pseudomyrmex is particularly vicious and enjoys jumping out of the tree to attack anything that touches it! Selective pruning behaviors of the Pseudomyrmex. triplarinus ant were examined in the tropical moist forest of Peru. It was hypothesized that if the ants were exposed to foreign leaves, then they would remove significantly more plant matter from the leaf than if they were exposed to leaves from the host tree. Ten Triplaris americana trees and resident P. triplarinus ants were exposed to plant material from three different species. The results were surprising. Ants were significantly more likely to attack a leaf pruned from the host tree than a congeneric leaf. Lending support to the idea that the mechanism by which ants prune plant matter is more complex than initially assumed. By taking on this experiment, we not only exercised our minds (biology skillz) and legs (hiking the "ant loop" everyday), but I also like to think that we increased our threshold for pain by taking on mutiple angry ant stings daily in the name of science. Perk? Maybe. Next time we find ourselves swarmed by Amazonian ants we'll let you know.